Home - Upper Valley Ambulance, Inc. Proudly serving the towns of Orford & Piermont, New Hampshire and Bradford, Corinth, Fairlee, Strafford, Thetford, Vershire, and West Fairlee, VT since 1990. Upper Valley Ambulance, Inc. is a pre-hospital service whose primary focus is to provide high quality emergency care to our nine member towns. Our organization is committed to providing efficient, prompt and creative transportation systems both on a local and regional basis. We will meet the ongoing healthcare needs of the communities that we serve, and strive to provide total customer satisfaction. We will be proactive in seeking new opportunities to fulfill this mission. Upper Valley Ambulance, Inc. began operation in July of 1990. This company is a non-profit corporation governed by a Board of Directors. In the fall of 1988 the town of Hanover announced that it intended to cease providing emergency ambulance service to the Vermont towns of: Bradford, Fairlee, Strafford, Thetford, Vershire, West Fairlee and the New Hampshire towns of Orford and Piermont. Initially, Hanover informed some of the towns that service would end in June of 1989 with the remainder of the towns having their service terminated in June of 1990. In June of 1988 a group of serious minded, dedicated people organize a planning committee to plan for emergency ambulance service after the termination date. The idea was to provide high quality emergency care to an eight town area on a 24 hour basis, staffed by full-time, part-time and volunteer E.M.S. personnel. On the planning committee each town was represented by a member of its F.A.S.T. Squad and an appointee of its Board of Selectmen. Additionally, other concerned persons joined the planning effort. The committee first requested that Hanover continue to serve all eight towns until July 1990 to ensure adequate time for planning. In December of 1988 the Hanover board of Selectmen granted the request for an extension of time. The planning committee met regularly during the nine months after its formation. An Executive Committee was created to direct the planning effort. Sub-committees or “Task Groups” were appointed to report on different aspects of an emergency ambulance service. 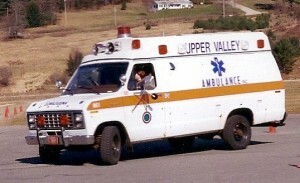 A non-profit corporation known as Upper Valley Ambulance Inc. was incorporated in Vermont as a vehicle for planning activities. The committee consulted with and received assistance from North Country EMS in New Hampshire, Vermont EMS, the Hanover Fire Department and regional ambulance services in Vermont. UVA went “live” July 1, 1990.